AyOk Products at AyOk Prices! AyOk offers a large selection of types and styles of home furnishings to match every taste and home decor. We have an every growing selection of exquisite decorating ideas for your home. Find something for that hard to decorate room of the house. 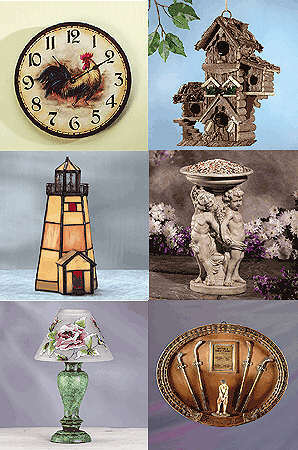 Everything from lamps and clocks, to lawn and garden ornaments we have in stock. Spruce up the house with a fresh new look. We hope you find just the right home decorating item you are looking for! Are you looking for an original gift idea? Then look no further. We have gifts for the home in every price range. Gifts that will long be remembered instead of being put in a closet. AyOk has great gift ideas for birthdays, weddings, holidays and any other special time. We sell only quality home and garden products on AyOk.com. When you make a purchase from AyOk for yourself or as a gift, you can feel confident that you are getting the finest possible merchandise for the price. Most orders ship out within 1 to 2 business days so you can have the gift in time for that special occasion. Continental U.S. orders only. You can order as much as you want, because we offer flat cost $5.95 shipping no matter how many items you order. ©Copyright 2003-2011 AyOk.com, and it's licensors. All Rights Reserved. We reserve the right to cancel and refund any order if there is a pricing or description error, or it is out of stock.